Boyd Gaines. Image by Sara Krulwich. A new English adaptation of Henrik Ibsen‘s 1882 An Enemy of the People (En folkefiende) staged by Doug Hughes yields lovely stage pictures (courtesy of set design by John Lee Beatty) and period appropriate costumes (designed by Catherine Zuber) warmly illuminated to suggest lamp light and sunlight (designed by Ben Stanton) to highlight Ibsen’s devastating themes of corporate greed and the dangers of majoritarianism. 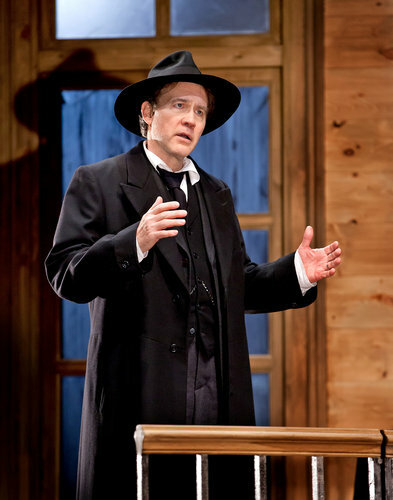 Boyd Gaines as Dr. Stockman, the scientist physician who rails against the corporate interests threatening his late 19th century Norwegian spa town, can be moving amidst the bombast. The heart beat of this story, however, despite a few powerful performances, is muffled within a stultifyingly staid and stolid production. The challenge of this particular production of this politically portentous story is its stolid, stand-and-deliver, ponderously pontificating tone. And for this director Doug Hughes‘ choices must be held responsible. Standing almost motionless, often in semi-circles, the uniformly solemn often bellowing townspeople tell the story. Several character actors (e..g Gerry Bamman as Aslaksen the printer) sometimes draw generous laughter for character moments dramatically at odds with the rest of the proceedings. Boldface story telling can be fun but in this case the type face wears thin.